Code – The code for this Payment Term. Description – The description of the terms. Days Available – Days available for a discount. Discount Rate – The discount if paid before days available. Days Before Due – Days before due, after which service charges can be levied. Apply Discount to Net Amount – Do not include taxes or freight in the discount calculation. Apply Discount to Freight – Include freight in the discount calculation. Customers – The list of customers that have these terms as a default. Vendors – The list of vendors that have these terms as a default. Accounts Receivable – The open AR entries that have these terms. 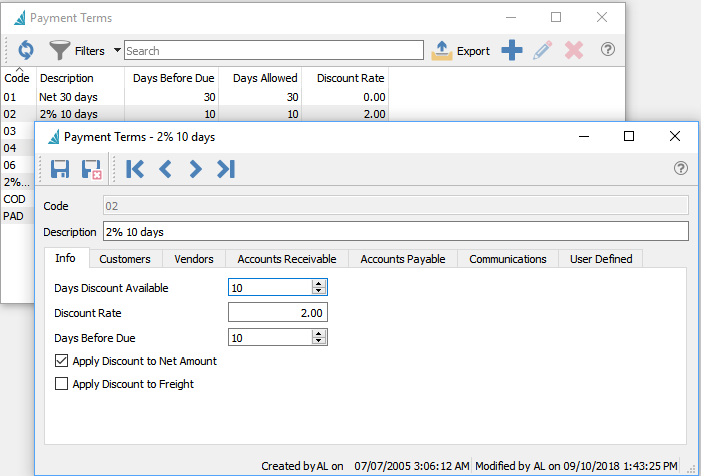 Accounts Payable – The open AP entries that have these terms. Notes – Any number of notes can be added to these terms.